With white embroidered flowers around the hem and down either side of the button fastening. Great for casual or smarter occasions so looks good with jeans or smarter clothing. Machine washable at 40C. M & S Per Una range pretty blouse. Pink, gold,grey and white in colour. Good condition. Freshly laundered. Size 14. LENGTH 22". THIS TOP HAS BEEN WORN ONCE/TWICE.IN IMMACULATE CONDITION.NO FLAWS! White Broiderie Anglaise Cotton Shirt Size 16 Bust 42" Length 25" V Neck V.G.C. 100% Cotton. Very good condition. 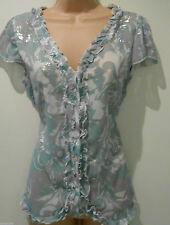 Wallis Ladies 12 Mint Green Floral Tunic Top/Blouse Beautiful coloured top comes with grey white speck of black rose. Floral print makes it stand outi. Back Zip opening. Pleated on neck part ,length upto waist,cap sleeves. Barely New without tags in Excellent condition. From a pet free and smoke free house. Per Una Top With Paisley Design And Waterfall Hem Size 14. Condition is New with defects-necklace missing. Dispatched with Royal Mail 2nd Class. Collar - V Neck - Cap Sleeve -Shear - Machine Washable. The colours are stunning! Looks greenish turquoise indoors and sea blue outdoors. Depending on light. I usually buy them toiletries as people forget those but they are needed. You could wear this as a scoop neck, pull it down over one shoulder or wear it off the shoulder bardot style. Blouse has cap sleeves with floral layer netting feature. V neck with 7 buttons down the front and alternate layer of fabric and embroidered floral design netting. There are two floral decorations on the left side of the neck. PER UNA 100% LINEN BLOUSE Ladies UK12. Semi Fitted. Cap Sleeves. In Excellent, possibly unworn condition. Length, top of shoulder to hem: 23". Marks and Spencer Per Una Ladies Blouse. UK Size 20. Length from neck to hem 68cm (approx). Collar with v neck opening and buttons and frill at front. Cap sleeves. Colour: Grey and white pattern. WHITE EMBROIDERED FLORAL COTTON WITH FRILLED NECKLINE. FRONT BUTTON FASTENING. Lovely color and material. in good condition. 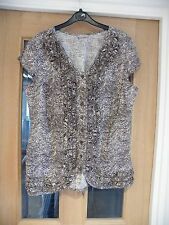 Per Una Sparkly Top, Size 14. Lovely black party top, overhead pull on style with round neck and capped turn up sleeves. Back is a stretch material and front is double layered with a striped sparkly overlay. Dispatched with Royal Mail 2nd Class. Ladies Pink Blouse Top from Per Una at Marks & Spencer. Cap sleeve. Length 24". Per Una Marks & Spencer Navy Blue & White Spot Print Casual Sheer Top. For sale a lovely casual top from the Per Una range @ Marks & Spencer. V shaped neckline with ruffle trim edging detail. Mainly navy blue in colour with white spot print pattern detail. Condition is Used. Small cap sleeves. Small frill down each side of front opening. PER UNA M&S Ladies Blouse. Pink and Green Floral Pattern. Short Cap Sleeves. Centreback to hem; 26". Pit to pit; 21". Rear Waist Tie. Very pretty top.Grainy material.3 different colour button down front.3 spare buttons.Ruffle hem and sleeves. Marks & Spencer PER UNA Black & White Non iron Blouse with short cap sleeves. Ruffled effect look. UK Size 12. Colours : Green, purple and cream. Looks great with a pair of jeans or leggings. Cap sleeves with elasticated cuffs. This informs us that you have received your item safely. Per una ( M&S) navy blue & white all over pattern blouse style top with ruffle details with Button fastening to front and cap sleeves size 14 Top is in good pre loved used condition tons of wear left - please see photos :-) Check out our other clothing items and more We ship Items the next working Day(Mon-Fri) via Tracked Courier Delivery in the Uk. International shipping is via eBay GSP. Please Contact us with any Questions. Ladies Cream Blouse Top With Blue, Brown & Green Floral Print from Per Una at Marks & Spencer. Cap sleeve. 100% polyester. Machine washable. Length 24". M&S PER UNA white blouse with Yellow Flowers and black detail. 27" shoulder to base. 26" underarm across. Per Una Lace Back Top Size 12. Dispatched with Royal Mail 2nd Class. Per Una Marks & Spencer White Swirl Embossed Hip Length Capped Sleeved Blouse Top. For sale a gorgeous hip length loose fitting casual lightweight top from the Per Una Range @ Marks & Spencer. White in colour with beautiful swirl embossed overlay pattern on front of top. PER UNA DEEP PURPLE CAP SLEEVE BLOUSE. A very delicate and pretty blouse from M&S Per Una range. Crinkled fabric, fully lined. Reason for Sale.